On the ground floor of the house is the spacious living and dining room and the kitchen. On the floor above there are the two bedrooms. The house is located a few steps from the shores of Lake Beetz, in a village belonging to 800 years old village Päwesin settlement. Päwesin is a village with about 600 inhabitants in the district of Potsdam-Mittelmark, directly on the border to the Havelland, surrounded by lakes, fields and forest. But it is also close to Brandenburg on the Havel, Potsdam and Berlin. The surrounding area therefore invites both to a quiet stay in the remoteness of the sparsely populated lake landscape as well as trips to the cultural institutions of the nearby cities. Very good can be spent on Lake Beetz also a varied beach holiday. The house was built in 2010 in the place of a no longer sustainable historic residential building. Both from the living room on the ground floor and the larger of the two bedrooms on the first floor you have panoramic views of a small tree-lined and shrubby foothills of the lake to which the property adjoins. In the spacious garden, which runs around the whole house, you can sit on the grass or on the terrace under a parasol and are completely alone. Your children can play in the sandbox or bolt on the grass. Apart from the guests of neighboring holiday apartments and some residents, you are surrounded only by smaller and larger birds, also many white storks, of game and rodents. The furniture is a very special combination of beautiful, old individual pieces and modern furniture. In the kitchen you will find a high quality and extensive equipment. Information on the history of the place and excursion possibilities are out. Internet reception is via WLAN. For smaller children, a highchair and a travel cot is available. In addition to the large living and dining area and the kitchen, one of the two bathrooms is located on the ground floor. It also houses the washing machine. A wooden staircase leads to the upper floor where, in addition to the two bedrooms, there is another bathroom with a bathtub. In the large double bedroom you'll find plenty of space to sleep, read, write and relax while looking out over the lake. Sloping ceilings (with plenty of freedom of movement) create a quaint atmosphere. The bed is equipped with two single mattresses. In the smaller bedroom there are two side by side single beds. In a utility room in the garden shed, next to the carport, the washing machine is housed. There are many nature beaches and sandy beaches that are not crowded, yet some offer surfboard, paddleboard and sailboat rentals or a cafe. The in-house rowing boat is not only very popular with anglers, but also by families and actually by all guests who want to explore the shore landscape from the sea side. Since the Beetzsee is part of a longer chain of lakes, the rowing possibilities are almost unlimited. The lifejackets for adults and children are welcome. The small center of Päwesin with its small baroque church is a short walk or 5 minutes away by car. The bakery of the Buddhist monastery "Backwahn" with its small café, located next to the church, has been a major attraction of the village since 2003. Many visitors swear by the cake, but the morning bakery is well worth the drive to the bakery. You can reach Brandenburg an der Havel in 20 minutes by car. There you can visit several museums, churches and a renovated in the zero years monastery (monument), all tell a lot about the history of the city. Not only in bad weather, the swimming pool with indoor and outdoor area, pool area and sauna is a good place to start. Restaurants and cafés have a wider choice as well as small shops and supermarkets. In the Havelland numerous cycle paths have been created in recent years, which invite to long tours on well paved paths in beautiful nature. If you do not have your own bikes, you can rent mountain bikes nearby or touring bicycles or e-bikes in Ketzin, Nauen or Brandenburg. Information about the dense network of charging stations for e-bikes can be found on the Internet. 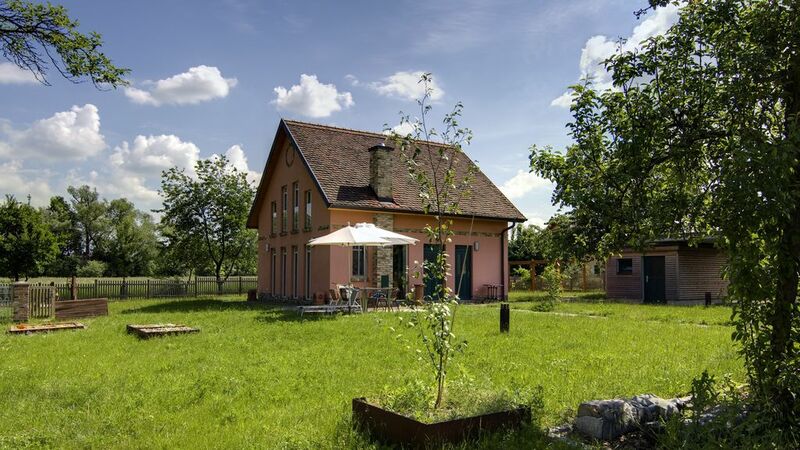 If you want to travel with several families or friends, you can also rent our other two cottages: In 30 meters distance there are the 'Seepavillon' with panoramic views for 2 persons and the semi-detached 'Watvogel' for 4-6 persons. Bed linen and towels can be provided at an additional cost: bed sheets, duvet and pillow case are for 12, - Euro per person hired. Towels (small towel and large towel) are for 5, - Euro per person hired. For Internet use a WLAN-enabled laptop must be brought. Cosy nice house and the end of a road, Directly at the lake shore. Very calm. Good atmosphere and intersting pieces of art in and around the house. We enjoyed the stay a lot. Und wieder: Erholung pur in Päewesin! Tolles Haus direkt am See, sehr ruhig, komfortabel! Wir haben uns hier während des verlängerten herbstlichen Wochenendes sehr wohl gefühlt. Alles ist großzügig eingerichtet, aller Komfort ist vorhanden. Schöne Küche, großzügiges Schlafzimmer, tolle Badewanne, schöner Wohnbereich! Bettwäsche und Handtücher kann man mitbringen oder gegen Aufpreis ausleihen. Das Boot liegt zur Ausfahrt bereit, wie schön! Sehr nette Verwalterin, die sehr bemüht und immer ansprechbar war. Man kann gut auch mit mehreren Familien kommen und noch die Ferienwohnungen und den Pavillon dazu mieten. Wir kommen sehr gerne wieder! Schöne Unterkunft, gut ausgestattet mit eigenem Garten, unmittelbarem Zugang zum See und eigenem Ruderboot. Abgelegen und sehr ruhige Lage, damit verbunden ein weiter Weg zum Einkaufen, damit verbundener Besuch in Ketzin oder Brandenburg lohnt sich aber. Ein wunderschönes Feriendomizil. Das Haus beeindruckt durch eine großzügige Raumaufteilung, liebevolle, geschmackvolle Einrichtung mit wunderbaren Sinn für ansprechende Details.Alles stimmig und hochwertig.Wir verlebten hier einen sehr schönen und erholsamen Urlaub in toller Natur und Abgeschiedenheit.So wollten wir es haben. Die Möglichkeiten für Tagestouren nach Potsdam, Berlin, Brandenburg wären gegeben gewesen, brauchten wir nicht. Fahrradfahren, Wandern, Angeln, Tier- und Vogelbeobachtungen bzw einfach mal die Seele und Beine baumeln lassen......das hat uns gefallen, ausgefüllt und glücklich gemacht. Was brauchts und will man mehr. Wir hatten einen wunderschönen Aufenthalt in der alten Gärtnerei! Das Haus ist traumhaft schön mit einem tollen Ausblick! Wir wurden nett empfangen! Die Nachbarn sind in der Nähe und extrem freundlich und hilfsbereit! Das Haus bietet alles, um einen tollen Urlaub zu genießen! Wir kommen gerne wieder! Located 20 km from Brandenburg an der Havel, 39 km from Potsdam. Nearby: Renaissance castle Ribbeck, Roskow Castle, Castle Paretz, golf course in Tremmen (10 km), hotel Bollmannsruh (3 km, outdoor tennis courts), sauna, boat ramps, equestrian facilities Roskower yard (5 km). Cycling: Bikes can be rented on the other side of the lake: www. nature sport project. de (approx 3km away land). Surfboards and sailboats at the firm nature sport project entleihbar, also it is possible to archery and rock climbing. The lake is popular for fishing. There are pike, eel, perch, walleye, whitefish other. The lake is mostly no deeper than 2 meters. Because the reed belt, it is recommended that you fish from a boat. What is needed is a fishing license (even on a daily / weekly basis available), also the fishing fee is payable. Both can be purchased in advance online at www. angel cards. com. Fried fish can be caught without a fishing license. The cooperative fisheries protection 'Havel' Brandenburg eG provide further information.